Hello me ol' Irish buddies. Yep, this greeting doesn't make too much sense, I'm currently running on 3 hours sleep so I shall use that as an excuse. There is one thing, hardly anyone knows about me and that is I am part Irish. So I always feel the need to celebrate Patty's day! We had a lot more people come than expected, but it was all good fun. Everyone was respectful and I was the only person to break something. Dam wine glasses! 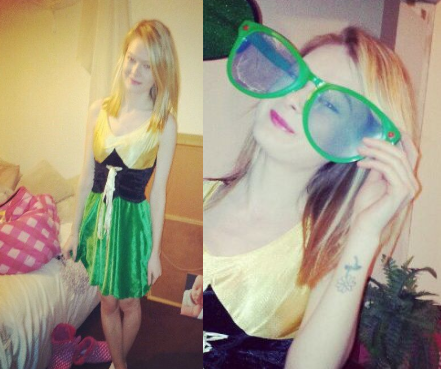 My outfit of the day, was obviously a St Patrick's style dress. I got this off Ebay last year for around £15. This is only a short random post, I wanted to see what you all got up to for St Patrick's. Did you celebrate? If so what did you do? Either way, I hope you all had a good day/night and let your hair down and relaxed. Thank you, hope you did too! Haha. Well minus the awful weather being in the way! Ah, I'll have to try and learn to say that phrase. An outstanding share! I've just forwarded this onto a coworker who was conducting a little research on this. And he in fact ordered me breakfast simply because I stumbled upon it for him... lol. So allow me to reword this.... Thanks for the meal!! But yeah, thanks for spending the time to discuss this matter here on your web page. Savеd as a faѵorite, I like уour blοg! artiсles or rеνieωs eveгy day along ωith a mug οf coffee.